Test All Media brings you a new way for your listeners to tell you what music they want to hear: it’s Test All Media Mobile. Your listeners are mobile, so you need to be mobile. 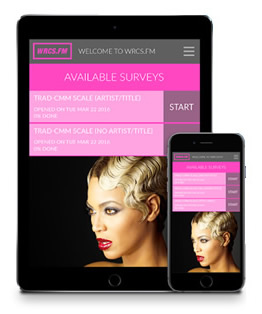 Listeners can now take their surveys from wherever they are -- on any connected device with a browser. Test music, websites, video, content, ads, images and more! Finally a new way to Test All Media with an engaging and stimulating digital research platform.